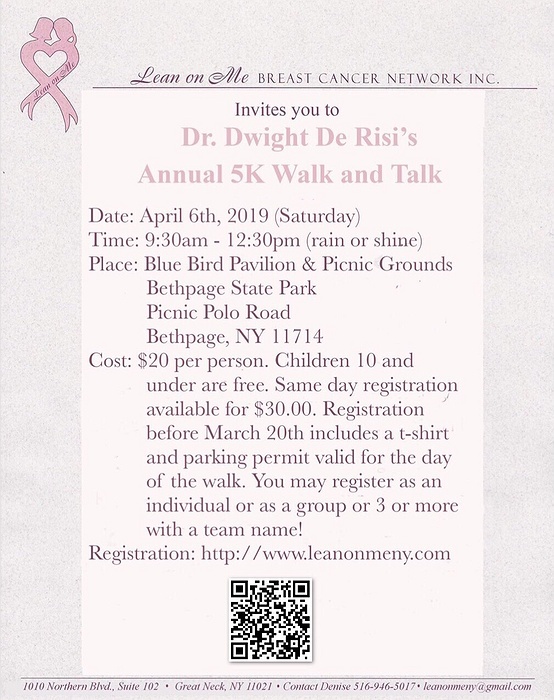 Subject: LongIsland.com - Your Name sent you Event details of "Lean On Me, Breast Cancer Network Annual 5K Walk & Talk"
Come join us for our annual 5K Walk & Talk to benefit Lean On Me, Breast Cancer Network. The walk is scheduled for Saturday 4/6 & begins at 10am. Check-in time is at 9:30am rain or shine! Registration is $20 per person. Children under 10 are free. Those registering as a group must provide their groups name. Your registration includes a Lean On Me t-shirt and parking permit if registered prior to 3/20. Same day registration available for $30 per person.